Driving through the Midwest is a bit like going for a long walk in the middle of the desert. Although, once in a while you are rewarded when you stumble upon an oasis. My journey through the Midwest was a bit like that too. Over 5 days, I drove about 2000 miles from Cleveland to North Dakota. For the most part, the scenery was monotonous and lacked any sort of variety. Fortunately, North Dakota’s prairies and badlands gave me a pleasant surprise and I had to actually pullover a few times by the freeway to get some pictures. Here’s the first half of this trip through Cleveland and Michigan, which were not too bad. 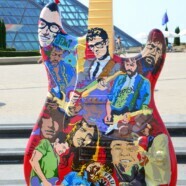 I started from Cleveland on Jun 14 with the sole item on my travel agenda being a stop at the Rock and Roll Hall of Fame museum. As someone who loves listening to and reading about different genres of music, this museum was a heaven for me. I spent around 4-5 hours going through every exhibit and felt that I learned a lot of new things about some of my favorite musicians. I liked how the museum is set up. There are seven floors in this pyramid shaped glass house. The first floor being the largest, covered the history of rock and roll. You start walking in a circle as you go through the several rare exhibits on the early influencers such as Leadbelly and Robert Johnson, followed by sections on different cities (decades) which shaped the rock and roll history. So, there’s Memphis (Johnny Cash, Elvis etc. ), Detroit (all the Motown stuff from the 50s), London (Beatles, Clapton and friends), San Francisco (the entire gamut of artists from the summer of love era), Los Angeles (folk rock groups like the Byrds) and finally Seattle (the 90s grunge sound). While doing this tour, I realized how the songs used in the TV show Wonder Years influenced my taste in music and how this soundtrack pretty much covered the rock and roll history from the 50s to the 70s. The top two floors of the museum had a special exhibition on Grateful Dead – one of my favorite bands. As I walked up to the topmost floor, I saw a huge screen projecting live concerts of this band. I associate their music a lot with my travels and the funny coincidence was that as I walked up near the screen, the song “China Cat Sunflower/I Know You Rider” started playing. It was a bit of an emotional trip (haha) because the lines “I know you rider, gonna miss me when I’m gone” remind of the time when I sold my motorbike when I was leaving Bangalore for the US. It’s tough to explain but it was perhaps one of the saddest days of my life. Anyway, after the museum tour, I was off to Kalamazoo, Michigan. Yes the same Kalamazoo mentioned in the CCR song “Down On The Corner”. Gibson apparently made guitars in Kalamazoo once upon a time. Kellogg still makes corn flakes in a huge factory near this little town. At Kalamazoo, I stayed for a night at the place of our family friend, Krishnamurthy’s. Krishnamurthy uncle was my dad’s roommate during dad’s post-PhD days. Both uncle and aunty are excellent cooks. I had some Bengali style fish with mustard seeds (shorshe baata) and some spicy Kerala style fish too. This meal was a very very welcome change. Considering that I hadn’t had a home cooked meal in while. The South Indian breakfast next morning was delicious too. That along with the filter coffee was the perfect ingredient to help me continue my journey to the thick of the Midwest.